A couple of years ago my blogging group was challenged by Leanne over at Diva of DIY to paint something with her Diva of DIY Chalk Mix. 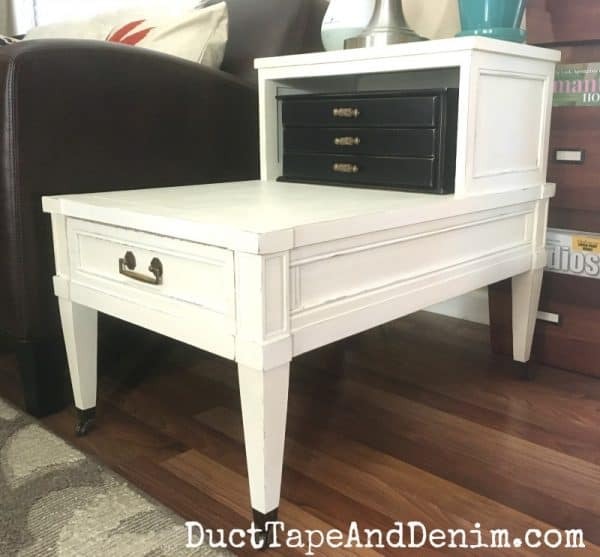 She sent us the chalk mix and I chose this old end table that I found at a local thrift store for $5.00! I painted it AND added a little secret on the back. Scroll down to see what that secret is… AND to get an update on how this finish held up. There’s actually a bit of a story behind this one. I bought it a couple of years ago to paint. But when I got it home my husband said he liked it. What?!? OK… If you say so. So we have been using it looking like this. 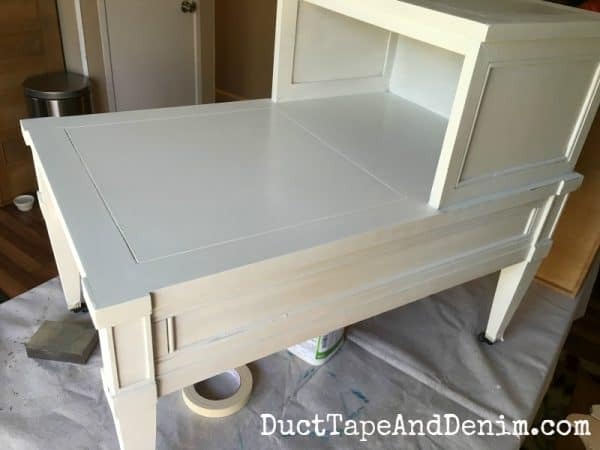 latex paint – I used Sherwin Williams white cotton. paint brush – This paint brush is my favorite. The chalk mix was easy to mix up. 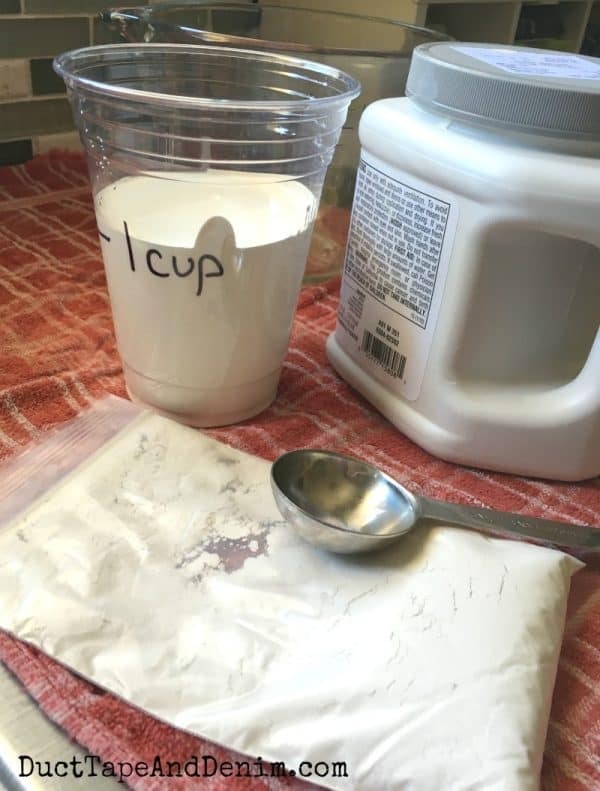 Just mix 1 cup of latex paint, 4 Tablespoons chalk mix, and 2 Tablespoons hot water. It can be adjusted to get the consistency you want. I like mine a little thicker so I didn’t add as much water. 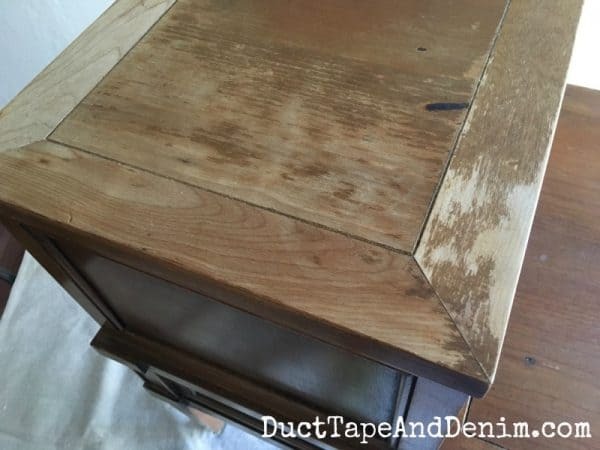 Usually I don’t sand at all when I use a chalk or mineral type paint but the finish on this table was a little rough, especially on the top shelf. So I sanded it down with my 160 grit sanding block. I didn’t bother sanding anywhere else. I’ll tell you, that first brush stroke was scary. There’s such a contrast between the old “orangey” wood and the white! 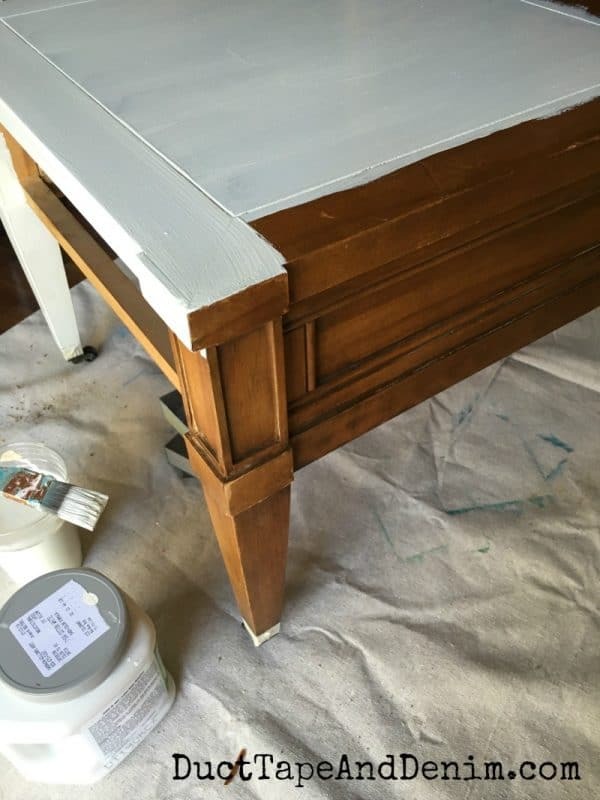 It almost covered in two coats but I had to go back in a few spots and give it a third coat of the chalk paint mix. Here’s my hidden secret, a power cord on the back! This was inspired by a trip to a local furniture store where the salesman showed us an end table that you could plug your lights into. It amazed me. All you had to do was TOUCH the table and the light would come on. 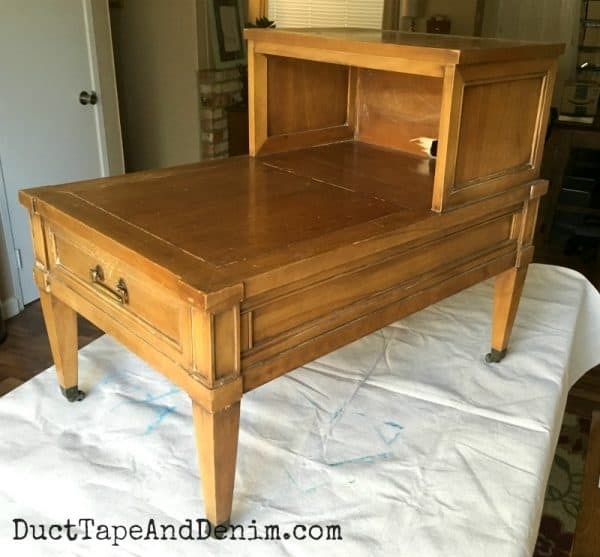 I didn’t realize end tables could cost $450 a piece. I’ll take this one for $5.00 and flip the switch myself. Now I can plug in my lamp, diffuser, and phone charger without cords hanging out all over in the back. And here’s the finished table, back at the end of my couch. The black jewelry box was another thrift store find that accidentally turned out to be exactly the right size for this end table. UPDATE: It’s been just over 2 years since I published this, so I thought it was about time for an update. The chalk mix was easy to mix and use but the finish hasn’t held up as well as my other small table projects. I’m not sure exactly why. The paint has chipped in a few places and a few of my lovely family members have left chocolate ice cream sitting on the end table and left some stains. I used a sample of Sherwin Williams paint. When I told the salesman at SW what I was going to use the paint for he told me I shouldn’t buy the sample because the quality wasn’t as good as their actual paint. I figured he just wanted me to spend more and buy more paint. Maybe I should have listened. I should have sanded the whole end table, not just the top. Chalk-type paints have spoiled me. 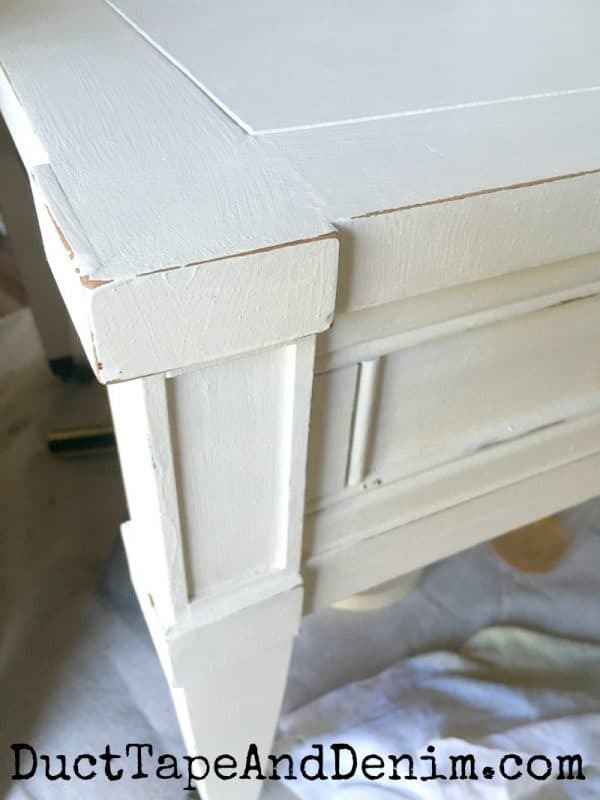 Sanding before painting isn’t usually necessary but will always help the paint adhere. I should have finished the top with a tougher top coat. Well, live and learn. I still like to try out new things and test new projects. Like I saw on my Facebook Lives… it’s only paint. If it doesn’t turn out the way you want it, you can always repaint it. 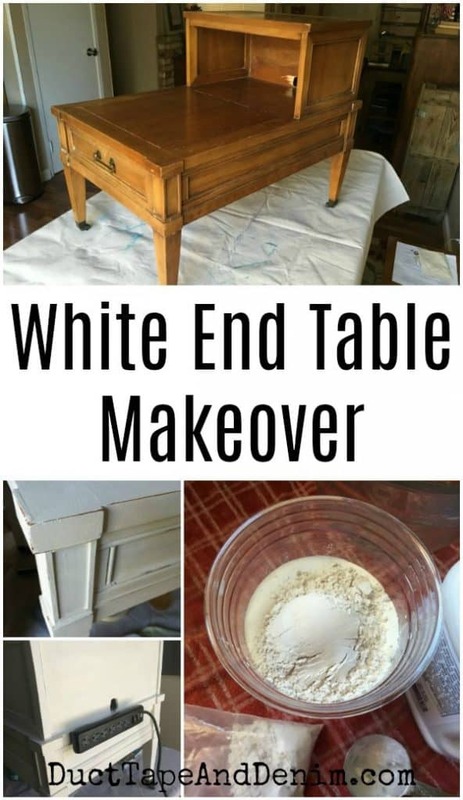 Which is probably what is going to happen to this white end table. Thanks for reading! Originally published Aug 26, 2016. What a transformation! Now that you’ve painted it and the character of that table is shown off! Love you hidden little secret by the way! 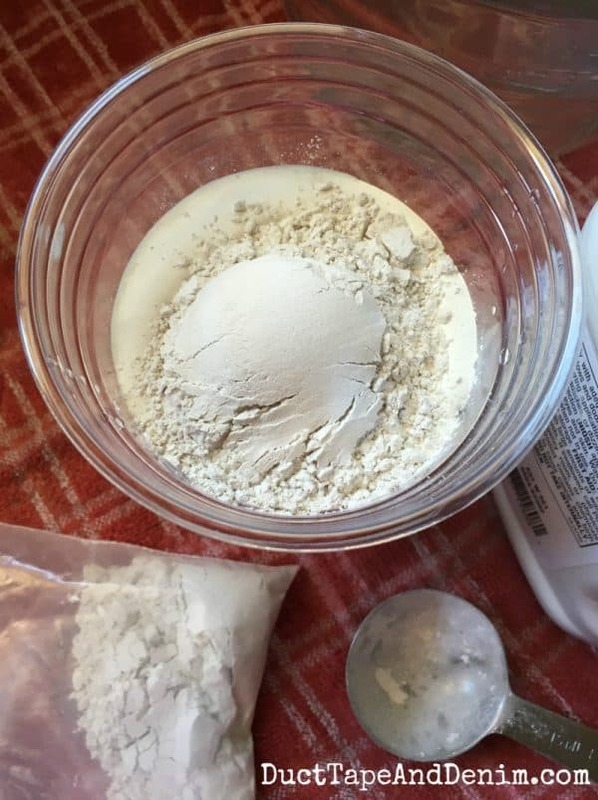 Thank you for participating in the Diva of DIY Chalk Mix Challenge! Awesome makeover! 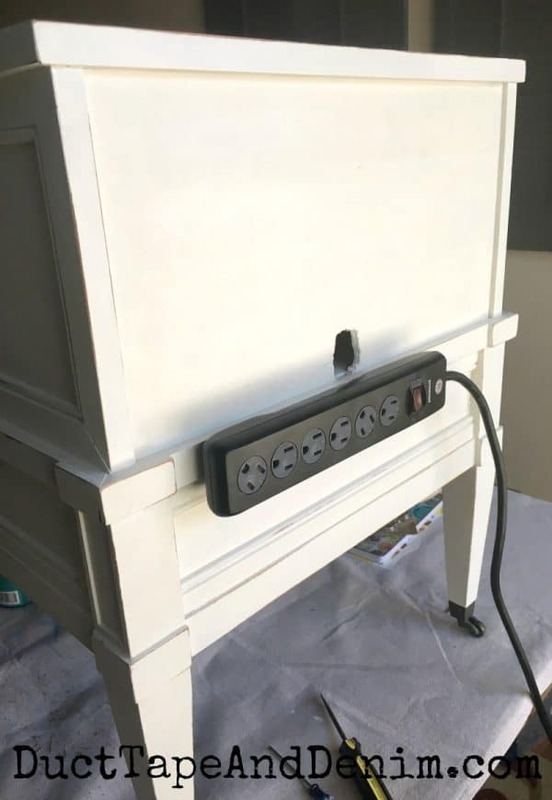 And I love the idea of adding the power strip to the back! Love this little table! Painting it really does give it that special something. The power strip idea is genius! I am totally doing that where ever I can. Love the color and the look after the refresh. Also clever to add the strip. Great job, as always. Love it. Your end table looks so fancy now! I love the way it turned out. I Laughed out loud when you said for $5 you would flip the switch yourself. haha, me too. That table looks great now! And I love the idea of the power strip attached to the back for cord management! The staff at Sherwin Williams always tell me the same thing. I use a chalk-like paint powder but a different brand. I really like it because I can mix up the amount I need. Your table looks great it the white. And what a good idea to install a power strip.